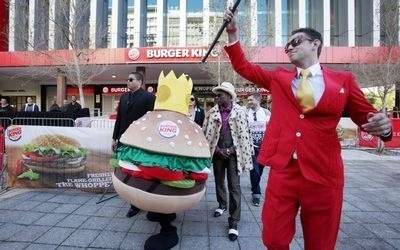 BURGER King will open the doors of its first stores in Gauteng on February 1. The global fast-food chain first launched in South Africa in May last year. Local gaming and leisure group Grand Parade, through its subsidiary Utish Investments, holds the master franchise agreement to expand Burger King in South Africa. The move is part of Burger King’s plans to expand into high-growth emerging markets. Three stores will be opened on one day in Gauteng, at 60 Rivonia Road, at North Station Food Court at Park Station, and at the Sasol Circle Centre at the corner of the R55 and Theron Street in Centurion. Burger King SA CEO Jaye Sinclair said this was in line with the company’s expansion strategy within southern Africa. “We have seen overwhelming success since entering the local market and are confident that our offering will be well received,” he said. Fast-food operators in South Africa have benefited from the cash-rich and time-poor phenomenon, where rising affluence among the country’s middle class has led to greater use of quick-service dining over formal sit-down restaurants and preparing food at home. Burger King’s presence will heat up competition in an already fierce environment where established players such as Steers and Wimpy, owned by Famous Brands, and US giant McDonald’s have been pushing aggressive promotions to attract customers. Burger King will also use South Africa as a platform to expand into fast-growing African countries. Its local licence agreement includes countries such as Namibia, Botswana, Zambia, Zimbabwe, Mozambique and Mauritius. Ramping up its expansion across the country, Burger King SA in July last year signed a deal with Sasol that will see an undisclosed number of its sit-down, takeaway and drive-through restaurants open at the oil and gas company’s petrol-station forecourts. To boost market share, retailers have partnered with petroleum firms as the changing lifestyles of time-poor consumers have boosted the demand for convenience stores. According to BMi Research, forecourt retailing is an ultra-competitive channel, with the economic environment and changing retail landscape significantly influencing where people shop and what they buy. José Cil, president of Europe, Middle East and Africa for Burger King Worldwide, said the agreement with Sasol allowed the company to position its brand across new channels and, therefore, expand its number of “guests and restaurants in South Africa”. Posted on January 16, 2014, in #retail, #southafrica. Bookmark the permalink. Leave a comment.